Thai Airways promotion: Non-stop from Scandinavia-Bangkok from €430! Qatar Airways sale promotion – List of discounted flights! Thai Airways, a Star Alliance member and one of top ranked airlines in Economy Class, is running new sale from Europe to various destinations in their scope. This time travellers in Scandinavia have some great option to fly non-stop to Bangkok out of classic tourist season for very attractive fare. Roundtrip non-stop tickets are now available from €430. We are also adding some great option to Krabi, famous beachside in Southern Thailand and solution to backpacker´s Mecca, Chiang Mai. You can use their service to more destinations in South East Asia. (Such as Vietnam, Cambodia, Myanmar, Laos, Philippines or Indonesia). This Thai Airways sale is valid for flights departing from Europe between 1st of May and 7th of June 2019. From Oslo or Stockholm also in March. Max stay 1 month. Promotion is available till 8th of February or until sold out..Below you can refer to our booking samples to each of the destinations in South East Asia or Australia. 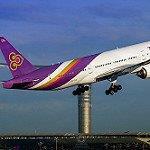 You can easily compare all available travel dates directly at the website of Thai Airways. Booking sample of this current Thai Airways promotion: Non-stop from Scandinavia to Bangkok from €430! In this case you would fly from Oslo to Thailand on 6th of May. Your return flight from South East Asia to Europe would be then on 18th of May 2019. Considering this is a direct service from Europe to Bangkok (althought out of main tourist season) this is an awesome deal for anyone who can easily reach Scandinavia..